Verlen Kruger died at 82 years old. The age stands out because it’s exactly twice the number of years he spent canoeing. He started paddling at the age of 41 later in life than most begin. It seems he spent the next 41 years making up for lost time. Kruger wasn’t just a man in the world of expedition canoeing; he was the man. The trips he took were nothing short of colossal in scope and mileage. While a host of equally tenacious partners joined him on his various expeditions, Kruger was the guy who did them all. He logged over 100,000 miles in a canoe, which is nearly the equivalent of four turns around the equator. If that’s too obtuse a metric for most of us to wrap our brains around, consider a river-based example. The typical Grand Canyon run from Lee’s Ferry to Diamond Creek on the Colorado River is 226 miles. This means you’d need to rack up 442 trips down the Grand to get close to 100,000 miles. With an average trip length of 16 days, that would mean over 7,000 days on the Grand. That’s 19 years of paddling every single day. Not incidentally, the Grand Canyon is an example of how Kruger continuously upped the ante. Not only did he canoe the entirety of the 226-mile stretch, he ran it upstream, against the flow. And not only would that have been enough of an accomplishment for most people to tell stories about deep into old age, the upstream run of the Grand was merely one short leg of a much bigger three-and-a-half-year expedition. From 1980 to 1983, he and Steve Landick paddled a 28,040-mile path, dubbed the “Ultimate Canoe Challenge.” The route looked like a deranged figure eight drawn by Etch-a-Sketch and plopped over a map of North America. The men began in Red Rock, Montana, and finished in Lansing, Michigan. Over the course of the circuitous adventure, they paddled rivers, oceans, lakes, and seas – from Alaska to Cabo San Lucas, and from the Pacific to the Atlantic coastlines. They eddy-hopped their way up the Colorado River, and paddled upstream against the massive currents of the Mississippi River. That was all in a day’s play for this World War II veteran and plumber. Born in 1922, Kruger began his life fairly traditionally. He was married and divorced a few times, eventually re-marrying his first wife. He had nine kids. He joined the military, then settled in Lansing. There aren’t many stories about his first time in a canoe at 41 years old, though we know he fell hard for his new passion. People who knew him well called him enigmatic, in the best possible way. He was charismatic, yet gritty and a little gruff. He could be obsessive and never lacked for confidence. He wasn’t afraid of much, though his fear of bears and armadillos was revealed when he talked in his sleep. While he loved to be in his canoe, he’d good-naturedly try to Tom Sawyer his friends into planning the logistics of the trips – a task that he did not relish. Almost everyone knew him to be lovable and inspiring. If his canoeing endeavors were any indication, the man also knew how to think big. His first major expedition took place nine years prior to the Ultimate Canoe Challenge. 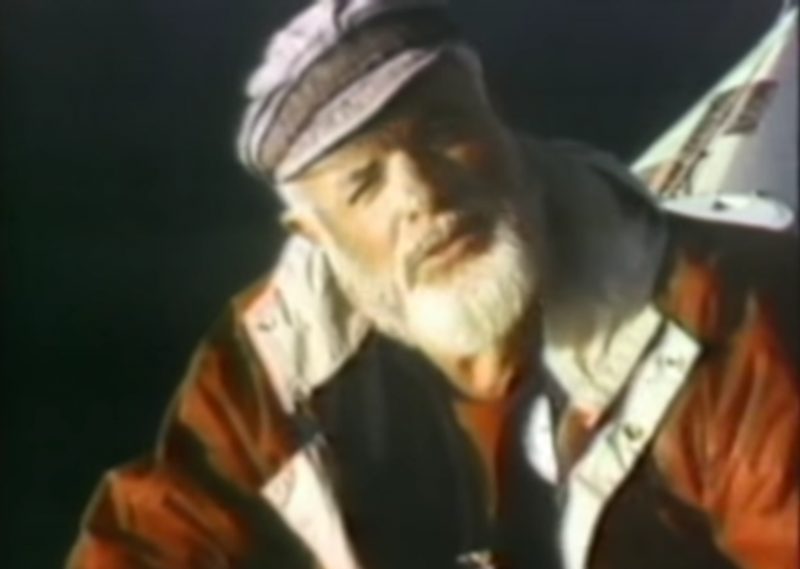 In 1971, he and Clint Waddell made what many assume to be the fastestever crossing of the traditional fur trade routes from Montreal, Canada, to the Bering Sea, in Alaska. They covered 7,000 miles (see note below) in 176 days. He raced in two downriver Mississippi Challenges, one with Valerie Fons in 1984 and one with Bob Bradford in 2001. At the 2001 event, the partners finished the 2,000-plus-mile course in 24 days and took first place. Kruger was 79 years old. From 1986 to 1989, Kruger partnered again with Valerie Fons for the Two Continent Expedition. This 21,000-mile (see below) odyssey took them from the northernmost reaches of the Northwest Territories, Canada, to Cape Horn, Tierra del Fuego, Chile. They paddled southeast across North America to the Gulf of Mexico, across the Caribbean Sea to Venezuela, and down the South American network of rivers to the Cape. They endured open water ocean crossings and massive floods that forced them to stay in the canoe for many nights on end. From these experiences, Kruger developed a deep well of knowledge that he was never stingy about sharing. He offered expedition advice to anyone who asked, and he designed and built more than 40 expedition canoe prototypes. Three of those models are still in production under the name Kruger Canoes. When you begin to unpack your dreams at 41, you can’t allow aging to slow you down much. Kruger certainly didn’t. His 80th birthday present to himself was to run the 2,040-mile length of the Yukon River. Kruger died two years later, in 2004, from prostate cancer. He is honored by a statue and memorial in Portland, Michigan, and a “Legends of Paddling” award from the American Canoe Association. Mileages are approximate, as they vary between sources. While most report minor differences of a few miles, some reports vary by over 2,000 miles. Despite these inconsistencies, Kruger’s achievement of paddling well over 100,000 miles is not in dispute. Where can this documentary be found? I’d love to see it.